Will be my first gig in Greece ! Looking forward to pay the modern ambient history in the The Place -Made in Athens- house of ambient alongside some of the most dedicated chill activists Alkan Ruler, Babag Mahamaya aka Babag, Optimus, Haris aka Fishimself and our headliner E-Mantra aka Emanuel Carpus probably with the presentation of his new album on Altar Records. Big hug to everyone who read me and make sure all your friends know about this gig. As it can be a great moment to visit beautiful Athens ! Hailing from Constanta, a port city on the Black Sea of Romania, E-Mantra is a seasoned veteran and prolific composer, with several releases on respected labels such as Suntrip and Altar, under a variety of aliases (E-Mantra, Emanuel Carpus, Neurosect, and Night Hex, to name a few). Early on in his career Emanuel was influenced by a wide variety of sounds, including acid, techno, and of course trance, but he’s primarily known for representing Goa Trance and Goachill / psychill / psybient (call it what you will). One of the things that makes his productions special is the emotional richness he brings to his craft, as well as his ability to create a sense of traveling into other worlds (both inner and outer). If you had a rocket ship to explore the stars this would be your ‘go to’ sound track. Each song tells a story. This happens through his choice of sounds, and of course arrangements. Textures are lush, as melody lines are tripped out with delays that intertwine and morph in and out of the soundscape. His leads often have a modulating acid tinge that harken back to classic early TIP releases. Lush, mysterious, and completely hypnotic, these are songs that are a true joy to listen to. 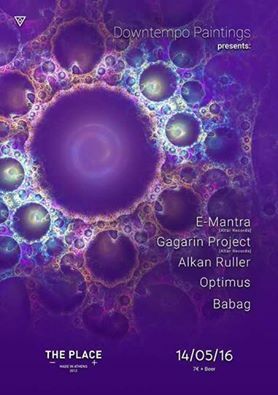 E-Mantra is always upping his game with each release, making him one of the most revered and respected producers from Eastern Europe, with several thousand followers on Soundcloud, and excellent reviews over the span of his career. One of the reasons he’s so popular is he represented Goa Trance at a time when Psytrance was on the upswing, so for fans of the old-school he became a sort of musical saviour. And while he’s moved on to other sounds to satisfy his artistic needs, he still maintains that respect for his roots, all with a polished, modern production that really allows the listener to get into a state of trance. Gagarin Project is the international project that has evolved from the ideas of conscious living, kindness and love to other humans, our brothers and sisters. Moreover it’s activity is greatly inspired by the values and traditions of ancient civilisations, universal principles of love, natural and healthy lifestyle. Nowadays the main artistic realization is centered around live dj mixes combining the music produced by good friends and many other interesting musicians from all over the world. With their music, Gagarin Project try to raise awareness of listeners throughout careful selection of tracks and soft introduction of voice messages recorded for that purpose. 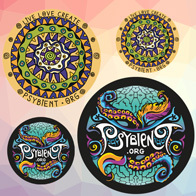 Despite a strong involvement in promotion of psychedelic downtempo music, the live sets are not limited to a certain genre, juggling between ambient, modern psychedelic bass music and trance techno grooves.Apart from performing as the collective of artists, Gagarin Project is highly involved into developement of psybient.org project, a web media dedicated to promotion of quality downtempo / midtempo music and events. The project headquarter is currently located in Paris. The team loves to play for people and share its passion with people, and had a chance to play at the biggest festivals all over the Europe (S.U.N. , Psy-Fi, Hadra, Nowhere and Waveform). At the same time Gagarin Project team often organises regular events in Paris based on participation and sharing. Reality is a creation of our mind. We change our-self – we change the world around us. cluding open air festivals and indoor/outdoor parties. He was also the founder of “Psy-Opt”, a short – timed but hyperactive crew of Dj’s, visual artists and supporters who used to organize several local events from the beginning of 00’s till 05. His virgin contacts with music synthesis had already given birth to “Myisis”, a Greek psychedelic band of friends in the years 1997-98. For all the following years he would commit himself into building knowledge around music technology, collecting and recording samples. His first conscious steps in producing came out effortlessly and most naturally after the birth of his daughter in 2006, which broadened his vision of creativity forms in music production. As a producer he mostly enjoys seeding oldschool elements in fresh context. His latest personal piece of work under the project name “Alpha-Tek” and with a dark pagan, hypnotic approach can be found in Ultimae’s compilation “Ambrosia”. Originally Greek – from Corfu island – but was born and lived most of my life in Switzerland and in Asia, mainly Thailand and India. I got many nicknames or alteregoes but the most known one is BabaG – with which i was known in my restaurant the Mahamaya and as Dj. Music was always my big love and since 1988 i worked in clubs, promoted live gigs and events, worked as music agent and had a small record label for 2 years. but after 12 years of this business I retired’ and i manged co-owned an indian restaurant together with a indian friend here in Berne – the Mahamaya until Sept. 2013. A dream (the restaurant) i had since a lot of years, after my extensive travels to india and SouthEastAsia came true. Now i’m off to new Horizons and also slowly moving back to the Motherland Greece & Corfu Island. In Asia i first came into contact with Psytrance music 1993. i loved it right away. i could not believe my ears and the response of my heart to it. since then it has been a love affair with this kind of music, but with the years i also started to listen more and more ambient and chilled tunes. This music played and plays all the time at home and in the restaurant and much more places I am, more.Since my retirement from the promoting, i started djing again. the main music i play is ambient, but i play also progressive and techhouse with that progressive twist. I play and played at many private and semi-private parties & events, but also in the QC swiss sunday chill sessions, or at the lounge of queersicht 05 & 07 (an intl. filmfestival here), as well at places like the Mumbai palace, gurtenfestival 06,07,08 & 09, at the Lounge b21 of the htl. zurichberg in Zurich 06 – 09 (chill’in with a view), bar Rouge in basel and in the Mahamaya of course.Most local places and clubs in Berne – like the Wasserwerk club, sous-soul, isc, reitschule, formbar, dampfzentrale, progr, bassment and some more. mahamaya shanti sunday events, fraka sound switzerland, Fullmoon festival Germany 2005 & 06, Universo Paralello festival 07/08, bahia, brazil, boom festival 08, Portugal, Boutique 08, playground 08/09, club Elf, Bassment, Streetparade 09, Aurora festival 09, Greece, Duo club, Bienne, Ambonight, Berne, Mystica 2010, Gurtenfestival 2010, presenting the chill-lineup @ Summer Never Ends Festival 2010, organiser of all cosmic soundscapes 2007 – 10, Dbar – Athens, Greece.Gurten festival 2011 (wow! ), Mokka, Thun, Ittheplace, Athens, Psychedelic Carneval 6, Xtra, Zurich, Mahamaya blend 2011, Universo Paralello 2011/12, Kapitel, Bern, Gurtenfestival 2012 & 13, Bern, Dayayoga – yoga sessions, Bern, 7sins,Athens, Kultarena,bern, Glasbrunnen 07/2013 & 2014 & 15, Universo Paralello 13/14 Bahia, Brazil, re:birth IT 14, Athens, greece, Gurtenfestival 2014 (epic! ), Rooftop Party Bern 08/2014, The Place, Athens, DayDance Mosaik Party 2015, Gurtenfestival 2015, Streetparade 2015 for Mosaik. Co-Organiser Downtempo Paintings Events at The Place, Athens, Greece.